Here is a cute housewarming gift for dog lovers – dog welcome statue that you can put at your front door, front porch or garden to welcome your guests. 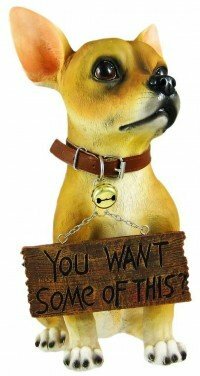 Greet your visitors with this dog statue that can convey 2 messages; ‘Welcome’ when you are in a good mood or ‘You want some of this?’ when you’re not exactly in the mood for visitors! Now, isn’t that cute and guarantee to bring a smile to your visitors’ lips. This adorable Chihuahua dog front door / lawn / garden statue measures 12 3/4 inches tall, 7 inches wide and 10 inches deep. It is heavy, fade and breakage resistant as well as made to last with extremely durable bonded marble resin. With its cute and adorable face, isn’t this a cheerful way to greet yourself when arriving home after a stressful day at work? Realistic looking, it can even fool the real chihuahuas! For those who stay in apartments or places where real dogs are not allowed, this realistic looking chihuahua dog makes a good replacement. If you have dog lover friends moving into new apartments, then this dog welcome statue would certainly make a lovely and cherished housewarming gift. You can bring up the festive cheer and dress it up with cute clothes that reflect the festive seasons. A lovely guard dog statue that welcome visitors at the main door, it has just the right size, color and features of a real chihuahua dog. For a bit of laughter, you can flip it to the unwelcome sign! 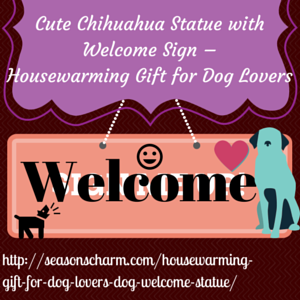 This is truly a great housewarming gift for dog lovers – Chihuahua dog welcome statue.